Social Media – I am. Are you? Swagbucks – It’s a Swago Promotion! 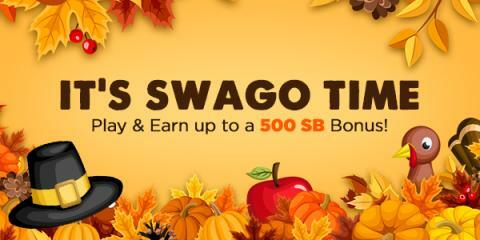 The digital rewards site Swagbucks is celebrating Thanksgiving early with another big “Swago” promotion starting Monday, November 6th at 9am PT and running until Monday, November 13th! That’s it. It’s super easy, and Swagbucks is for real. I use it myself, and I’ve earned over $1,000! Many have been asking what Points Programs are out there, so I have decided to post about a few opportunities. This time I’m discussing MyPoints, a points program I have been using since 2006. 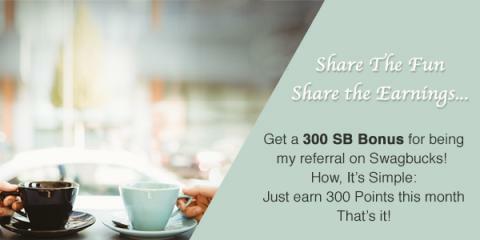 Plus, I get a referral bonus when you sign up, so try it out! MyPoints is THE leader in points programs, hands down. MyPoints is a rewards program where you get paid by collecting reward points. MyPoints pays you for signing up for offers, referring friends, making online purchases at certain retailers, completing surveys and tasks, and more. Points can be exchanged for gift cards or cash via PayPal. 1. Sign Up – Get $2.50! Sign up for an account through this link, and start off your account with 250 points a/k/a $2.50. MyPoints will send you daily emails, if you opt in to receive them. Click on the link in the email, and you will earn 5 points. This is the quickest way to earn points, and it’s oh-so-simple. Open email, click link, delete, repeat! Using the MyPoints Deals tab, you can earn money by completing free and paid offers, like trying new products and services, or joining a mailing list. Deals range from $.25 to $20, and are updated daily. Earn 10 points for each coupon you print and redeem on MyPoints! The more you print, the more you earn, print and redeem 10-15 coupons in a month and earn 25 Bonus Points. 16 or more coupons in a month and earn 50 Bonus Points. Answer some questions, get paid, it IS that simple. Surveys usually pay between 50 points to 300 points. It is important to note that if you attempt a survey, and are disqualified, you still get 10 points! That’s free money! If you shop online you might as well earn cash back. Check out the available retailers at MyPoints and the percentage that you get back on the MyPoints Shop page, as what you receive in cash back varies from store to store. Yes, you can watch videos on MyPoints and get paid to do it! Earn One (1) Point for each video you watch! From entertainment to finance, MyPoints offers videos that are up to date and interesting. Make MyPoints Search and Earn your portal to the web! Start your searches using this feature, and earn points when you search online. Once you have used MyPoints for a while and decide you like it, share it with your friends using your referral link and receive 25 Points each time you successfully refer a friend to the MyPoints program. When your friend spends $20 or more, you get more points! And you get 10% bonus points for all of the eligible points earned by your referral – for life! Note: Points are roughly 0.62 cents each, meaning that $10 = 1600 points. The minimum payout is $10 for most rewards, but payment through PayPal starts at $25. So what are waiting for? Earn cash daily on MyPoints, and refer your friends, relatives and associates, and you can make a good amount every month with MyPoints without much effort! What do you think? Have you used MyPoints before, and if so, do you like it?